This post is a part of our Octopus 3.4 blog series. Follow it on our blog or our twitter feed. As a new feature, we wanted auto-deploy to be something we'd be confident and proud to release; something that matched the ease-of-use and intuitiveness of Octopus currently. Basically, it had to just work and leave you nodding your head with a smile. We held onto that vision, even though the waters were unclear on several occasions. This post is a look back at some of the decisions leading up to the feature we've established as elastic and transient environments. Sounds pretty simple. Can't be that hard, can it? We madly started pinning checkboxes and radio-buttons on the existing environment and deployment target screens, eager to start giving users the option to opt-in to these new elastic and transient behaviours. People finally got to play with the feature inside Octopus for real. And they weren't happy. Neither was I. Something didn't feel right (even though the features were developed 1:1 with the mockups that everyone thought was a good direction). 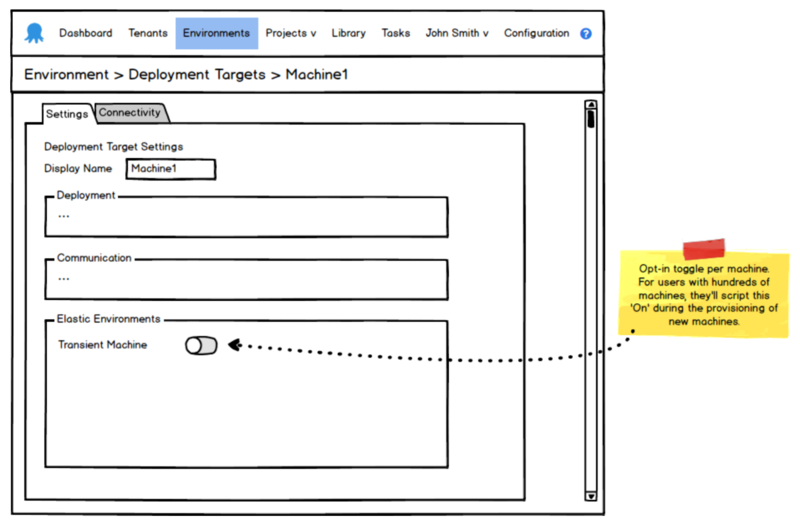 To me at least, it felt like we were suddenly complicating the existing environment and deployment target screens that we loved using for their simplicity. There was also this lingering feeling that it would be hard to expand these features in the future, without just adding further bloat to these existing screens. We'd lost our way, but decided to continue developing the back-end functionality in the meantime, while giving ourselves time to arrive at an answer for our UI issues. It wasn't long before Paul came to the rescue by reminding us of an older idea that had been kicking around called machine policies. Suddenly there was this idea that you could attach a policy to a machine. 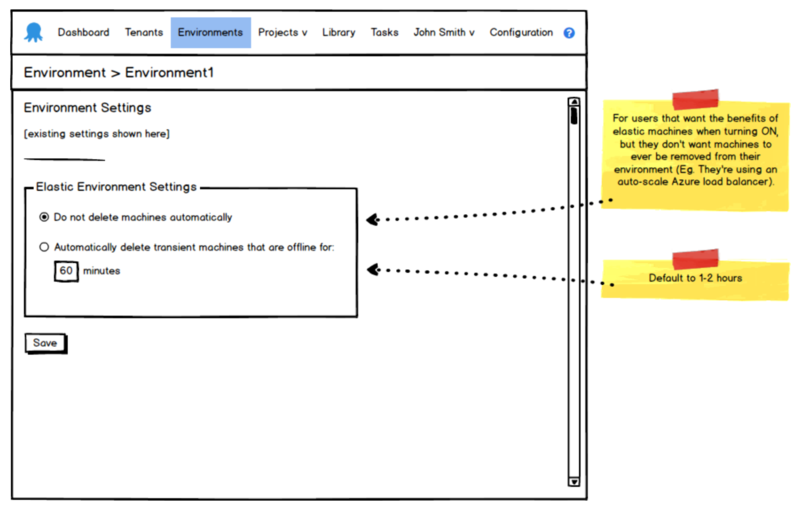 It abstracted and isolated the elastic and transient logic away from the environment and deployment target screens, which also made working with the data-model much easier from a programming perspective. This was perfect for what we needed. Some fresh mockups + some fresh hope! We were on our way. We explored this idea for several weeks and it was mostly doing what we needed. As we got closer to that finish line however, there was still this lingering feeling that something wasn't quite right. We all knew it, we all said it in several meetings, but we couldn't pin-point it for some time. Can you spot it by looking at those machine policy mockups? The number of smiles that this little scribble gave is hard to describe. It cleared away all the noise (that voice in the back of your head that's been saying something's not right) and we suddenly knew where the finish line was. Project triggers allowed us the same flexibility and separation that machine policies had facilitated several weeks earlier and gave focus solely to auto-deployments. It also expanded the possibilities for auto-deploy. We could restrict auto-deployments to certain criteria, like roles or environments. 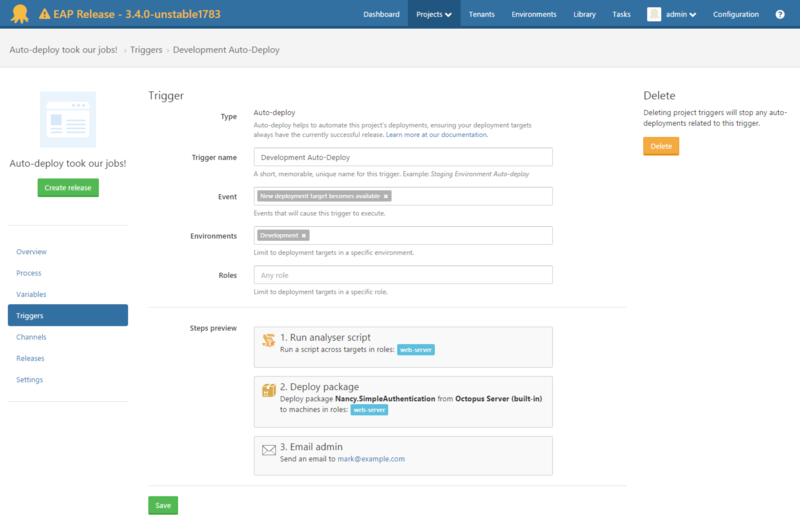 We could have multiple triggers facilitating different purposes (one for your Development environment, one for your Staging environment etc). This was awesome! So now we had the vision. The implementation however, was still unsure. We investigated several approaches to implementing auto-deploy. Some of these got completely thrown out after being 90% implemented (not exaggerating). It was like a final branch in the road. Only one branch leads to the actual finish line, but all of them look like they lead to the finish line from where you stand. Personal note: This was an interesting and very new experience for me. Before Octopus, I've been used to working to a strict schedule and budget, so you can only choose one road (and if it doesn't end up being great, tough, you're now stuck with it). But Octopus encourages us to explore all possibilities so we get the best outcome for our customers, and this was one of those times. We started by exploring a notification system we termed domain events (just like NSNotifications for those iOS junkies like me out there). 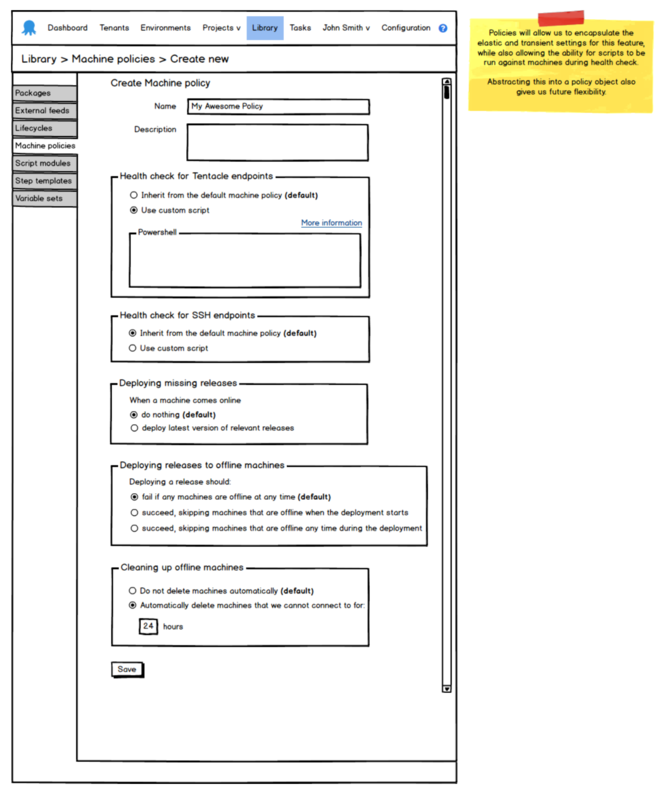 The idea was that we could register for events within Octopus (such as MachineEnabled, MachineDisabled, MachineAdded etc.) and we'd listen for those events and respond with an auto-deployment when necessary. The concept of event sourcing was floated as an idea to avoid the architectural problems we were encountering. We already use a table called Event in Octopus to create an audit history whenever significant events happen in the system. 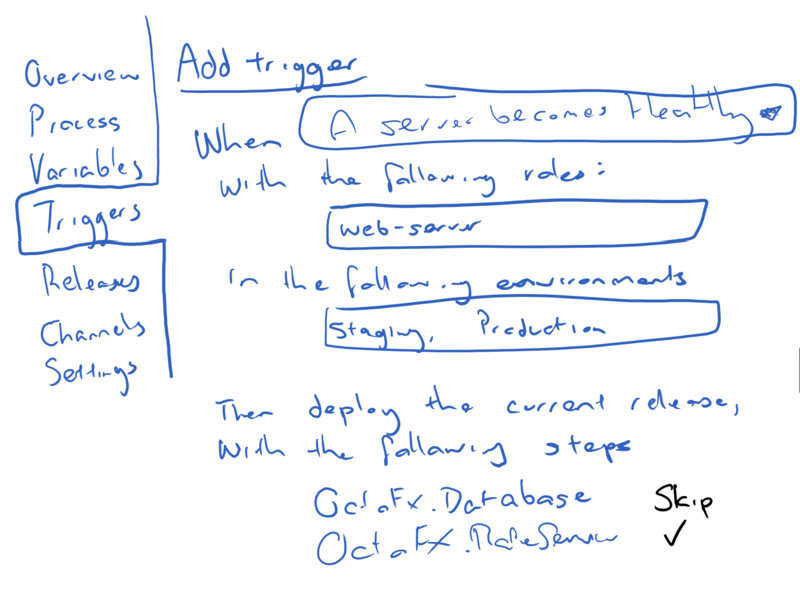 So extending on this Event table allowed us to explore an event-sourcing architecture very easily. For example, when a machine is added, we post a domain-event for MachineAdded. The domain-event listener then populates the Event table on our behalf. This is quite nice, because it means we have a single class (the domain-event listener) that controls which events are being populated for auto-deploy. Our auto-deployment engine is then simplified to a pure event-sourcing architecture, which makes it more isolated and easier to test (and works under HA). It runs every 15 seconds and scans the Event table to see what events have occurred since it last passed. It then analyses and balances these events in terms of positive events (machine was added, came online, was enabled) and negative events (machine was deleted, went offline, was disabled) and can then decide on what releases to auto-deploy. With all that said, I'd like to say a personal thank you to the whole team and especially the community for reaching out and sharing their thoughts and feedback. 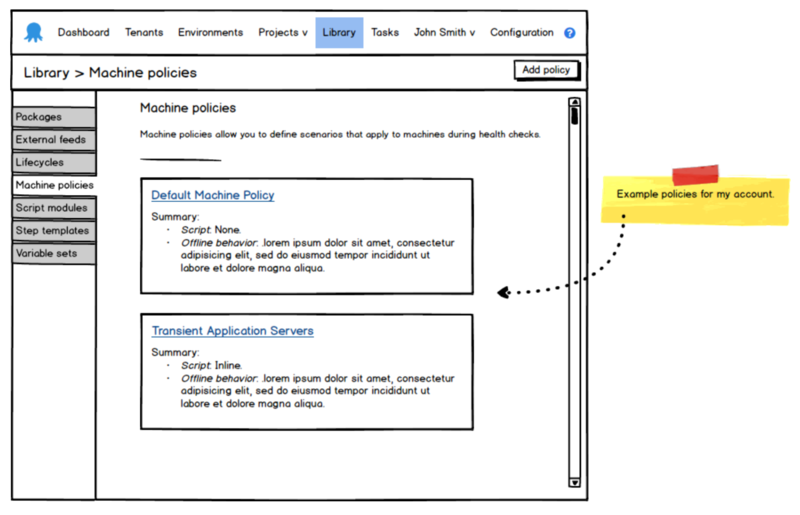 This has been a massive effort and it all leads to what we have today, currently in 3.4.0-beta0001: Elastic and transient environments with a clear distinction between machine policies and project triggers.